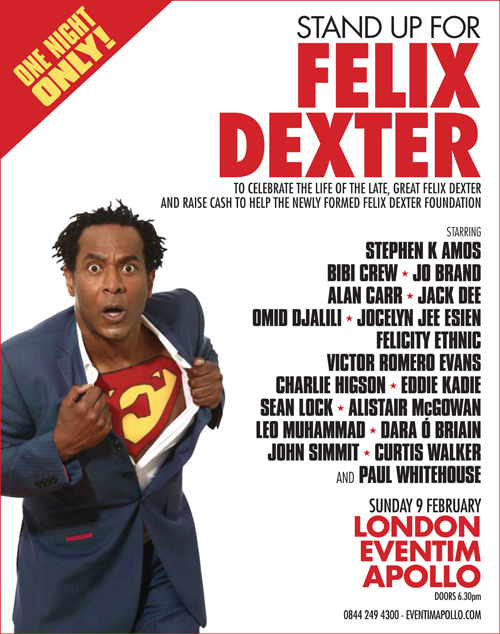 Some of the biggest names in UK comedy are coming together next month to celebrate the life of the late, great Felix Dexter and raise cash to help the newly formed Felix Dexter Foundation. Alan Carr, Curtis Walker, Jack Dee, Jocelyn Jee Essien and Eddie Kadi will be among those performing during the event, which is being organised by Paulette Randall – who was the associate director of London’s Olympic Opening Ceremony. Felix, who was born and raised in St Kitts, sadly passed away last October after a three-year battle with multiple myeloma. His will provides for the setting up a fund to help educate underprivileged children in the UK and St Kitts. Paul Whitehouse, who worked with, and recently dedicated his British Comedy Award to Felix, says: ‘Felix was a brilliant comedian who made me and countless others laugh and think with his funny and challenging characters.